Step by step walk through of the cluster launch process with Azure using Containership Kubernetes Engine (CKE) on Containership Cloud. In order to launch a cluster on Containership Cloud with Azure, be sure to have properly configured your provider by following all of the steps outlined in this document. 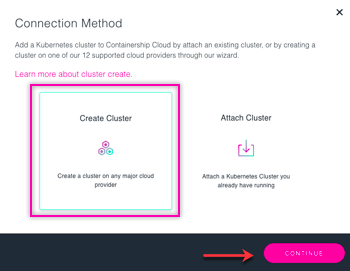 Once you have logged into Containership Cloud select the pink Create button, then select Cluster. Select Microsoft Azure from the list of providers and press continue. 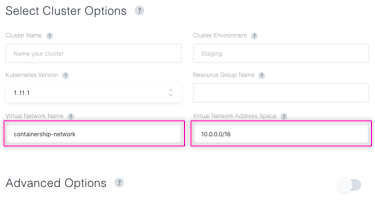 Give your soon to be cluster a name and environment name. Then selected the preferred version of Kubernetes you want to launch. Enter in the Resource group name. If necessary name your master node pool, otherwise it will be given the default name of master-pool-1. The next step is to determine the instance type from the drop down list. Refer to Microsoft Azure official documentation for details about each instance type. Now you have the option to determine the number of nodes within your master pool. 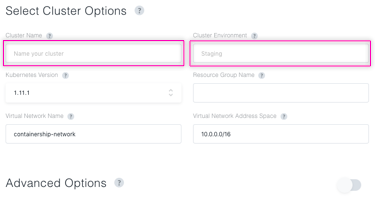 You can either launch with a single node master (typically for non-production environments), or enable High Availability using the toggle. This will automatically bump the node count to 3, and deploy a multi-master Kubernetes cluster. Advanced options can be configured by using the toggle. Once all options have been correctly configured, press continue to advance to the next screen. If necessary name your worker node pool, otherwise it will be given the default name of worker-pool-1. 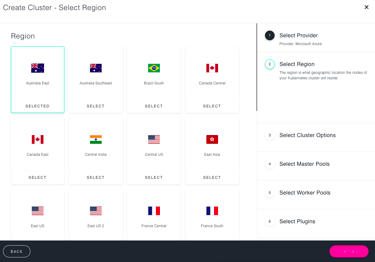 If you would like to add additional worker node pools select the add button at the bottom of the screen and repeat the steps above. 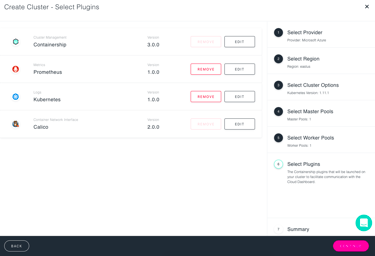 Plugins are a great way to add functionality to your new cluster for things such as logging or metrics. 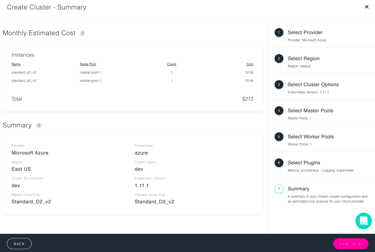 By default, the Containership Plugin will be installed on the cluster as it powers the Containership Cloud dashboard. 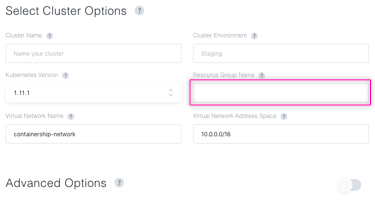 To add a plugin to your cluster, just choose the ones you would like to include from the list of options. One satisfied you hit the continue button to proceed. Once all of the previous steps have been completed you will be presented with a summary of your soon to be cluster. This summary will include estimated monthly costs as well as details about the cluster itself. Once satisfied, select continue. 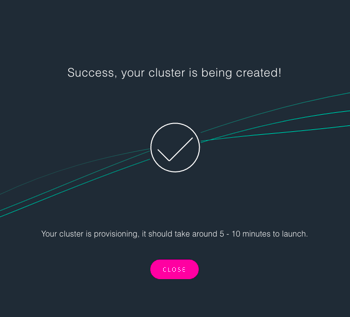 You cluster will now start to provision! Depending on the size and region the cluster will take 15-20 minutes to get up and running.